I’ve been married for nearly three years (our anniversary is next month! ), and it’s only in recent months that I’ve mustered up the courage to, wait for it, make food without following a recipe. My cookbooks were my lifeline to making edible food. Without guidelines to follow, I felt all panicky and insecure. How long should I sauté the zucchini? What temperature should the chicken be cooked at? How much salt am I supposed to add? Cookbooks provided soothing answers: 15 minutes. 375 degrees. One teaspoon. At some point in the last half-year, I realized that I had gained enough experience and confidence to tentatively strike out on my own. No longer was I bound to an ingredient list. The only limitations were the supplies in my kitchen and the food in my cabinets. It’s been kinda fun. 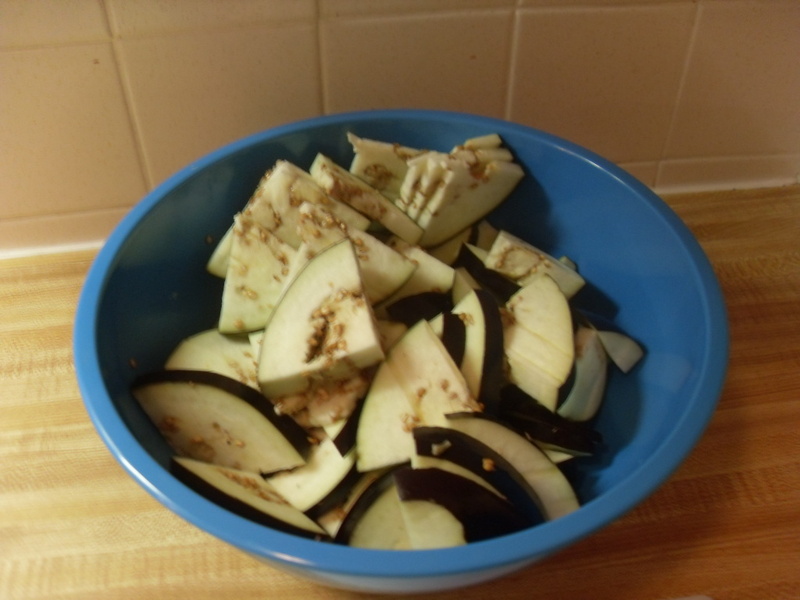 Yesterday I remembered that there was an eggplant in the crisper which I had intended to use for Shabbos, and hadn’t. There was also a half-full jar of marinara sauce waiting to be finished, and thus, tonight’s dinner was born. 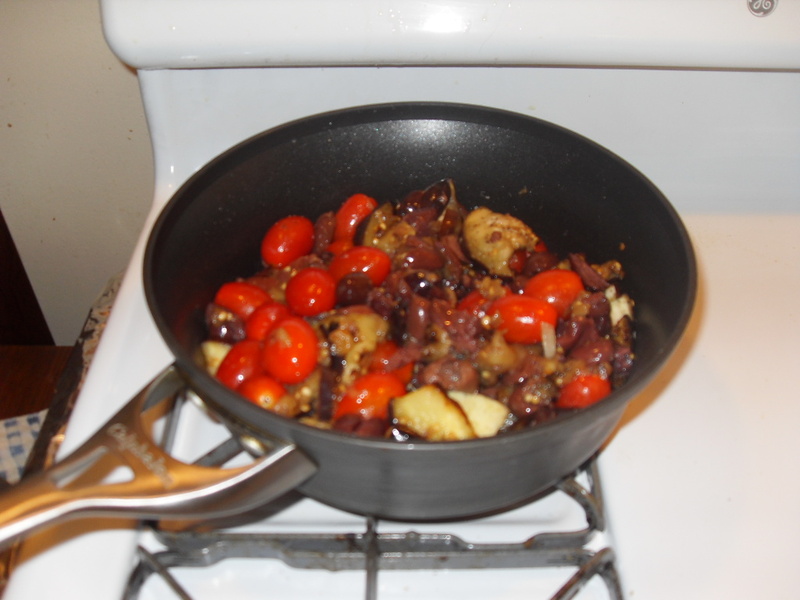 Meanwhile, I sautéed the onions in a separate skillet before adding them to the other veggies. Then I added the crushed garlic, marinara sauce, spices and cheese. I simmered over a low flame for a few minutes, and voilà! We added a loaf of garlic bread and some white zinfandel and it was a nice dinner. Awesome! I’m totally trying this next time instead of messing with the whole breading/baking/layering/baking again. Thanks! Pleasure! It was really good and we both ate too much. Uggghhhhh. Ah, yet another subject near and dear to my heart. If I had the money and didn’t have to pay for childcare, I would SO go to culinary school. I “follow” recipes frequently, but I always tweak and change them. The main reason I go to my cookbooks is for inspiration, secondly for cooking temperatures, rarely for an actual list of ingredients. Tonight is a perfect example. I am making a quiche for my mom’s group meeting tomorrow, but I couldn’t remember exactly how many eggs I should put in, so I went to an online recipe for quiche lorraine (which contains swiss cheese and bacon,) to figure out how many eggs are needed for a quiche with similar ingredients (turkey sausage, mushrooms, mozzarella.) When I was at the store, I bought Italian turkey sausage, and ended up putting some of that with the chicken, peppers and onions over rice that I was making for dinner (something I made up on the fly after looking in the fridge – we eat so much chicken on the grill it can get boring.) AND because I had my thinking cap on, I cooked up extra sausage and onions for my sausage, onion, apple & walnut stuffing that I normally make for Thanksgiving. I’m going to pop it in the freezer and warm it up next week when I add my apples & walnuts. I was pretty proud of myself for that one. I don’t think I’ve ever used one ingredient for 3 separate recipes before, so that was fun for me to do. Cooking is such an enjoyable and relaxing thing for me, I could (obviously) go on and on about it. It’s nice when you can improvise and it turns out yummy. Congratulations! And I’m so happy you found kosher kalamata olives! I love them and use them frequently in my cooking, too. You are my cooking hero. One item, three recipes! Wow! And that stuffing sounds delish! I’m just now starting to think of what to make for Thanksgiving (my parents are coming in. Yay!). I still have that problem where I only know how to cook following recipes. My husband can take whatever ingredients we have in the house and throw them together into a meal, but I never know what to do with what I have unless he tells me ideas! I do like finding and using recipes though! I’m impressed that your husband can throw together a meal, period. Mine makes a mean sandwich, and can cook up some great Near East rice, but actual cooking? Forget it! Recipes are really great. One of my friends got me a subscription to Bon Appetit, and while I had to make a ton of substitutions for nearly every recipe, everything I made from that magazine was mouth-watering good. These pictures make it look even better! Congrats on graduating from cookbooks to self-books :-) where you will soon be able to write your own cookbook!! Do you really serve wine with every dinner? That’s waaay too fancy for me! Thanks! 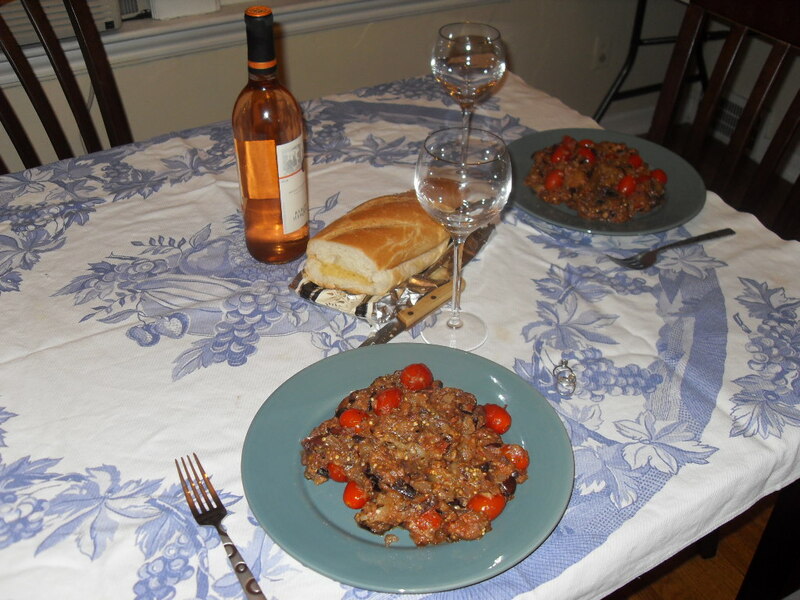 And no, we don’t usually have wine with weekday dinner, usually only on Shabbos. But last night my husband bought the bottle and it just seemed to fit with our dinner menu.